Imagine a future in which a device connected to a computer can print a solid object. A future in which we can have tangible goods as well as intangible services delivered to our desktops or highstreet shops over the Internet. And a future in which the everyday "atomization" of virtual objects into hard reality has turned the mass pre-production and stock-holding of a wide range of goods and spare parts into no more than an historical legacy. Such a future may sound like it is being plucked from the worlds of Star Trek. However, while transporter devices that can instantaneously deliver us to remote locations may remain a fantasy, 3D printers capable of outputting physical objects have been in both development and application for over three decades, and are now starting to present a whole host of new digital manufacturing capabilities. 3D printing may therefore soon do for manufacturing what computers and the Internet have already done for the creation, processing and storage of information. Such a possibility has also started to capture mainstream media attention. The Economist, for example, has now published several articles on 3D printing, including The Printed World (February 2011), and most recently the superb 3D Printing Scales Up (September 2013). The following provides an overview of 3D printing technologies and their present and likely future application. For a full list of 3D printer manufacturers, as well as initiatives and organizations pioneering their application, please see my 3D Printing Directory. Or for a six minute overview, just watch my video below. Oh, and for 70,000 words on the subject, you may be interested in my book 3D Printing: The Next Industrial Revolution. 3D printing is an additive technology in which objects are built up in a great many very thin layers. The first commercial 3D printer was based on a technique called stereolithography. This was invented by Charles Hull in 1984. Stereolithographic 3D printers (known as SLAs orstereolithography apparatus) position a perforated platform just below the surface of a vat of liquid photopolymer. A UV laser beam then traces the first slice of an object on the surface of this liquid, causing a very thin layer of photopolymer to harden. The perforated platform is then lowered very slightly and another slice is traced out and hardened by the laser. Another slice is then created, and then another, until a complete object has been printed and can be removed from the vat of photopolymer, drained of excess liquid, and cured. Stereolithographic printers remain one of the most accurate types of hardware for fabricating 3D output, with a minimum build layer thickness of only 0.06mm (0.0025 of an inch). Another 3D printing technology based on the selective solidification of a tank of liquid -- or 'vat polymerization' -- is DLP projection. This uses a projector to solidify object layers one complete cross-section at a time, rather than using a laser to trace them out. One of the leading manufactuters of this kind of printer is envisionTEC with its Perfactory range of 3D printer hardware. A final 3D printing technology that creates objects by using a light source to solidify a liquid photopolymer is known generically as 'material jetting', or commercially as 'polyjet matrix'. This was pioneered by a company called Objet (now a part of Stratasys), and forms object layers by emitting liquid photopolymer from an inkjet-style, multi-nozzel print head. After each layer is printed a powerful UV light is then used to set it solid before the next layer is printed. The really clever thing is that the Connecx range of 3D printers created by Objet can jet several different materials from their print head, and in varying combination. This allows up to 14 of 120 potential materials to be printed at the same time. This means that objects can be printed with, for example, both hard plastic and rubber-like parts. You can learn more about this very impressive technology in this video. Rather than solidifying a photopolymer, another category of 3D printer hardware is based on material extrusion. Here a semi-liquid material -- and most usually a hot thermoplastic -- is deposited from a computer-controlled print head. This process was invented by Scott Crump in 1988, who set up a company called Stratasys to commercialize his invention. Crump chose to name the technology 'fused deposition modelling' or 'FDM', and patented and trademarked these terms. Hence, while many people use the phrase 'FDM' to refer to this kind of 3D printing, only Stratasys actually makes FDM 3D printers. Others manufacturers refer to the same process as 'thermoplastic extrusion', 'plastic jet printing' (PJP), the 'fused filament method' (FFM) or 'fused filament fabrication' (FFF). If you are getting the idea that the terminology used in 3D printing is a bit of a nightmare then you are right. You can find a great article reporting attempts to standardize terms here. Whatever it is called, one of the key benefits of FDM is that objects can be made of out of exactly the same thermoplastics used in traditional injection moulding. Most FMD 3D printers can print with both ABS (acrylonitrile butadiene styrene), as well as a biodegradable bioplastic called PLA (polylactic acid) that is produced from organic alternatives to oil. Within a decade developments in synthetic biology are likely to make the direct production of PLA from a range of biomass materials quite common, hence allowing 3D printing supplies to be grown in many a back yard. In addition to being used to output plastic objects, material extrusion printers have also been developed that can output other semi-liquid materials. The applications are already quite diverse, and range from 3D printers that can print in cheese or chocolate, to concrete printersthat may in future allow entire buildings (or large parts thereof) to be 3D printed. D-Shape have even created an enormous 3D printer that can build objects in a form of synthetic stone. A third broad category of 3D printer hardware creates object layers by selectively sticking together successive layers of a powdered build material. This can also be achieved in two ways. Firstly, there are printers based on binder jetting (also sometimes known as 'inkjet powder printing'). Here a glue or 'binder' is jetted from an inkjet style print head to stick together successive powder layers. Most commonly the powder used is gypsum-based composite that needs to have its surface coated after printout if a robust object is required. Some binder jetting printers -- such as the ZPrinter 850 from 3D Systems -- jet both a binder and coloured inks from five print heads, so allowing full-colour 3D objects to be created at up to 600x540dpi. Other binder jetting printers can build objects by sticking together plastic powders, sand or even metals. Where a binder is sprayed onto sand, the final object is used as a mould in '3D sandcasting', with molten liquid metal poured into it. Once the metal has cooled solid, the sand is then broken away. Binder jetting metal printing has been developed by a company called ExOne (who also make 3D sandcasting printers). Here a layer of bronze or stainless steel metal powder is laid down and a print head moves across it to selectively spray on a binder solution. A heating lamp then dries the layer, and a fresh layer of powder is rolled over it, and the process repeats. Once all layers have been output, the object is then placed in an oven to fully cure the binder. At this stage the object is still very fragile, but is put in a kiln where it is infused with additional bronze powder. The final result is a very solid object that is a least 99.9 per cent solid metal. You can see the results of this amazing process in my "Online 3D Printing" video embedded further down this page. Rather than spraying on a binder, an alternative method to stick powder granules together is to apply heat. A well established 3D printing technology that works in this manner is selective laser sintering (SLS). This builds objects by laying down a fine layer of powder and then using a laser to selectively fuse some of its granules together. At present, SLS 3D printers can output objects using a wide range of powdered materials. These include wax, polystyrene, nylon, glass, ceramics, stainless steel, titanium, aluminium and various alloys including cobalt chrome. During printing, non-bonded powder granules support the object as it is constructed. Once printing is complete, almost all excess power is able to be recycled. When SLS is used to directly produce metal objects the process is also called direct metal laser sintering (DMLS). Metal objects created by a DMLS 3D printer are about 99.99 per cent dense, and hence can be used in place of traditional metal parts in the vast majority of applications. (There are some good pages on DMLS here). While DMLS 3D prints metal objects directly, it is also common to use laser sintering to produce wax objects that are then sacrificed in a traditional lost-wax casting process. Here, once the wax object has been 3D printed a plaster mould is poured around it. When heated, the wax then melts and is poured away, after which a liquid metal can be poured in. Once this cools the plaster is removed, leaving a metal object that -- in some senses -- began its life on a 3D printer. A closely related 3D printing technique to SLS is known as selective laser melting (SLM). This uses a laser to fully melt the powder granules that form a final object, rather then just heating them enough to fuse them together. As yet another variant, a technique called selective heat sintering (SHS) uses a thermal print head -- rather than a laser -- to apply heat to successive layers of a thermoplastic powder, and as explained in depth here. There is also a very similar processes that uses an electron beam to fuse together metal powers, and which is known as 'electron beam melting'. I discuss this technology in more depth in this article on Engineering.com. Finally, as yet another variant of powder solidification, there is a 3D printing technology called 'directed energy deposition' (also known as 'laser powder forming'). Here a powder of stainless steel, copper, nickel, cobalt, aluminium or titanium is blown into a high-power laser beam for deposition as a molten build material. A wide range of commercial 3D printers for industrial application are now available from a range of manufactuers, the two largest of whom are 3D Systems (which works with most technologies and is rapidly acquiring many smaller manufacturers) and Stratasys (which offers FDM and polyjet matrix harware, as well as special 'drop on demand' wax 3D printers for dental work). Both of these companies had a market capitalization at the end of 2012 of over $3 billion. Other large 3D printer manufactuers that are publically traded are Archam (which produces electron beam melting (EMB) machines), the aforementioned ExOne with their metal and sand binder jetting 3D printers, and Organovo, who specialize in bioprinting. Other large but private 3D printer manufacturers of note include EnvisionTEC (who specialize in DLP projection hardware but also make a 'bioplotter' for tissue engineering), EOS (who make selective laser sintering devices for producing objects in metals or sand), Voxeljet (who make really large printers for binder jetting in sand or plastic powders), SLM Solutions (who specialize in selective laser melting), and Optomec (who produce directed energy deposition printers using their own 'laser engineered net shaping' (LENS) technology). You can find information on these and other industrial 3D printing manufactuers in my 3D Printing Directory. Prices for most commercial/industrial 3D printers tend to start in the ten-to-twenty thousand dollar bracket and spiral upwards into the hundreds of thousands of dollars for very-high-end machines that can build fully-dense metal parts. Although some desktop models are on the market, most commercial 3D printers are usually fairly bulky and often floor-standing. For home enthusiasts and lone inventors who want to start 3D printing themselves, a growing range of personal 3D printing initiatives, kits and printers are also now available. For those seriously into real DIY, there are two open source 3D printing initiatives called RepRap -- which stands for the Replicating Rapid-prototyper -- and Fab@Home. These initiatives are both based around online communities that use the web to share all designs and other information required to build a printer based on materials extrusion technology. For those not keen or able to scratch build, several companies now sell 3D printer kits, often based on the above RepRap designs. For example, BitsfromBytes.com sells its RapMan 3.1 3D printer kit from £795, and its pre-assembled BFB-3000 3D printer starting at under £2,000.RepRap Central is also a great supplier of 3D printer kits costing from £599 upwards. In addition to several RepRap models, these include the MakerBot Thing-O-Matic. Most recently, 3D Systems has launched a number of Cube Personal 3D Printers as part of itsCubify undertaking to bring 3D printing to the masses. These wi-fi enabled devices are designed to be very easy to use, and sell from $1,199 upwards. The higher-end models even print in three different colours of thermoplastic at the same time. Most current 3D printers are not used to create final consumer products. Rather, they are generally employed for rapid product prototyping, or to produce moulds or mould masters that will in turn allow the production of final items. Such printing of 3D objects already enables engineers to check the fit of different parts long before they commit to costly production, architects to show detailed and relatively low-cost scale models to their clients, and medical professionals or archaeologists to handle full-size, 3D copies of bones printed from 3D scan data. There are also a wide range of educational uses. The range of products that have employed 3D printers in their design process or to produce final moulds or mould masters is constantly growing. To date such products include automobiles, trainers, jewellery, plastic toys, coffee makers, and all sorts of plastic bottles, packaging and containers. You can even now purchase a 3D printed Sad Keanu Reeves. More usefully, some dental labs have for some years been using 3D printers to help create appliances, with envisionTEC selling its Perfactory Digital Dental Printer for use in the creation of crowns, bridges and temporaries by dental technicians. Using this technology, even long-term temporaries can now be created, meaning that 3D printers can quite literally already print you new teeth! envisionTEC 3D printers are now also widely used by many major hearing aid manufacturers to produce ear moulds and shells for final consumer use. Whilst most 3D printers are currently used for prototyping and in pre-production mould making processes, the use of 3D printing to manufacture end-use parts is also now occurring. This is becoming known as direct digital manufacturing (DDM). As Fortus explain, for low-volume manufacturing DDM is more cost-effective and simpler than having to pay and wait for machining or tooling, with on-the-fly design changes and just-in-time inventory being possible. For example their customer Klock Werks Kustom Cycles has built one-of-a-kind motorcycles using a Fortus 3D printer to directly digitally manufacture some of the required custom parts. Another company using 3D printing to create final products is Freedom of Creation (and which was recently acquired by 3D Systems). Their range of incredible, designer 3D printed products includes lighting, furniture, trays, bags and jewellery. In a similar vein, two companies -- Make Eyewear and Protos Eyewear -- are now manufacturing designer sunglasses using 3D printers. Many believe that 3D printers have a great future in the creation of fashion items including jewellery and shoes. For example, Forebes recently reported on a Shoes from a 3D Printer that Smell Like Bubblegum, with injection moulding set to give way to 3D printing to allow maufacture-on-demand and higher levels of customization. 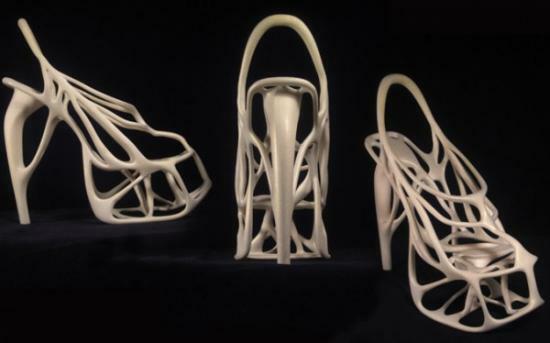 You can see even more 3D printed shoes here. It is also already not just a few specialist plastic items that are being made using a 3D printer. For example, engineers at the University of Southampton recently 3D printed a flyable aircraft(well, aside from its electric motor). Rolls Royce is also currently running a project calledMERLIN with the goal of using 3D printing in the manufacture of civil aircraft engines. A driveable prototype of a new electric car called the Urbee has also been 3D printed. Mainstream automobile makes are also already in on the DDM act, with Audi now 3D printing parts of its cars using Objet Polyjet 3D printers. Some artists are now also using DDM to create their masterpieces. For example, sculptorBathsheba Grossman already uses 3D printers to create her works. In the future, museums could also print out exhibits as required from their own digital collection -- something that theSmithsonian is already working on -- or indeed from a global archive of artworks scanned from long-lost or too-delicate-to-display originals. You can find out more about 3D artworks, including a great video, on the Singularity Hub. Those wishing to create 3D printed artworks or other objects, but who lack 3D software design skills, can now use services such as those provided by Tri Axis Art. Whether or not they arrive en-mass in the home, 3D printers have many promising areas of potential future application. They may, for example, be used to output spare parts for all manner of products, and which could not possibly be stocked as part of the inventory of even the best physical store. Hence, rather than throwing away a broken item (something unlikely to be justified a decade or two hence due to resource depletion and enforced recycling), faulty goods will be able to be taken to a local facility that will call up the appropriate spare parts online and simply print them out. NASA has already tested a 3D printer on the International Space Station, and recently announced its requirement for a high resolution 3D printer to produce spacecraft parts during deep space missions. The US Army has also experimented with a truck-mounted 3D printer capable of outputting spare tank and other vehicle components in the battlefield. As noted above, 3D printers may also be used to make future buildings. To this end, a team at Loughborough University is working on a 3D concrete printing project that could allow large building components to be 3D printed on-site to any design, and with improved thermal properties. Another possible future application is in the use of 3D printers to create replacement organs for the human body. This is known as bioprinting, and is an area of rapid development. You can learn more on the bioprinting page, or see more in my bioprinting video or the Future Visionsgallery. In an age in which the news, books, music, video and even our communities are all the subjects of digital dematerialization, the development and application of 3D printing reminds us that human beings have both a physical and a psychological need to keep at least one foot in the real world. 3D printing has a bright future, not least in rapid prototyping (where its impact is already highly significant), but also in the manufacture of many kinds of plastic and metal objects, in medicine, in the arts, and in outer space. Desktop 3D printers for the home are already a reality, and should cost no more than a few hundred dollars by 2015. 3D printers capable of outputting in colour and multiple materials also exist and will continue to improve to a point where functional products will be able to be output. As devices that will provide a solid bridge between cyberspace and the physical world -- and as an important manifestation of theSecond Digital Revolution -- 3D printing is therefore likely to play some part in all of our futures.